Oxpecker Research Facility unveiled at Mokopane: The National Zoological Gardens of South Africa’s Mokopane Centre unveiled its custom-designed oxpecker facility on Friday 18th July 2008. This facility is for the research of Red-billed Oxpeckers with the aim of breeding and relocating these endangered birds to areas throughout South Africa. In the 1900’s oxpecker numbers were drastically reduced as a result of the use of dips to treat livestock against tick infestations. As a result, many oxpeckers, whose main source of food is ticks, were killed by the poison. Since that time, awareness has been created of more oxpecker-friendly cattle dips. This has helped to restore the symbiotic relationship that previously existed between the oxpeckers and the cattle that it rids of ticks. In the wild, oxpeckers rid many large antelope of ticks. In January 2008, the National Zoo announced that it had successfully bred a Red-billed Oxpecker at its Mokopane Centre in the Limpopo Province. What made this such an extraordinary hatching is that oxpeckers are difficult birds to maintain in zoos due to their high activity levels, unique dietary requirements, and their complex relationship with ungulates. The only other record of successful breeding of captive oxpeckers is from the Zurich Zoo, in Switzerland in 1973 where the first record of a Red-billed Oxpecker to leave a nest in a zoo environment was noted. 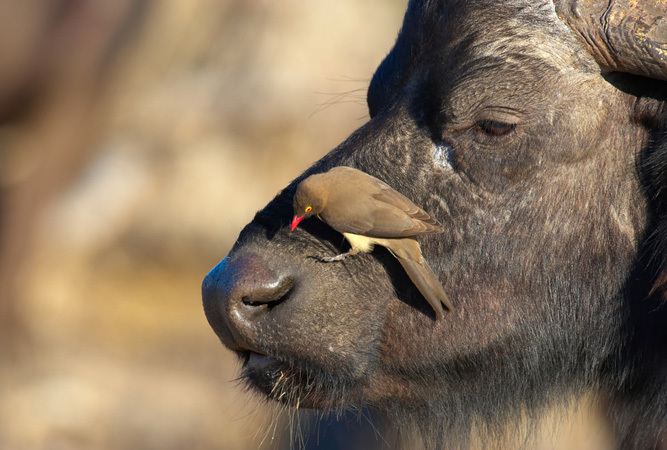 Oxpecker breeding was last attempted at De Wildt, South Africa in the late 1980s. The National Zoo embarked on the design and construction of a facility to house Red-billed Oxpeckers for research purposes. The birds bred will eventually be released back in to the wild to boost the oxpecker population. In 2007, in conjunction with the Endangered Wildlife Trust’s Operation Oxpecker, several birds were captured in mist nets. Of the birds caught some remained at the Centre for a research project conducted by a doctoral student. 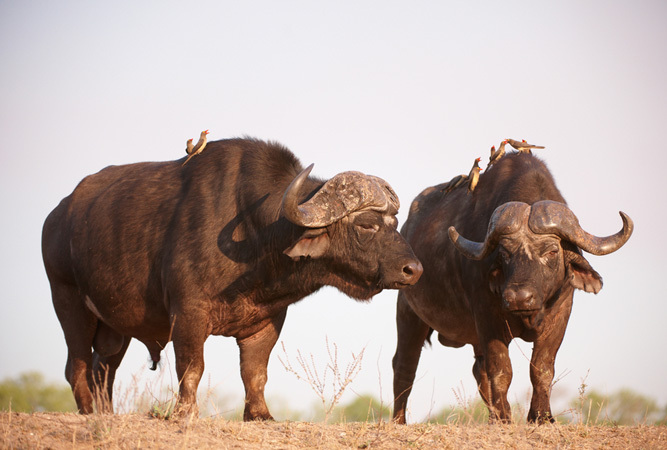 The study centres around the symbiotic feeding behaviour of Red-billed Oxpeckers as well as gaining scientific information on maintaining and further breeding attempts. The first part of the study included controlled feeding preference experiments. 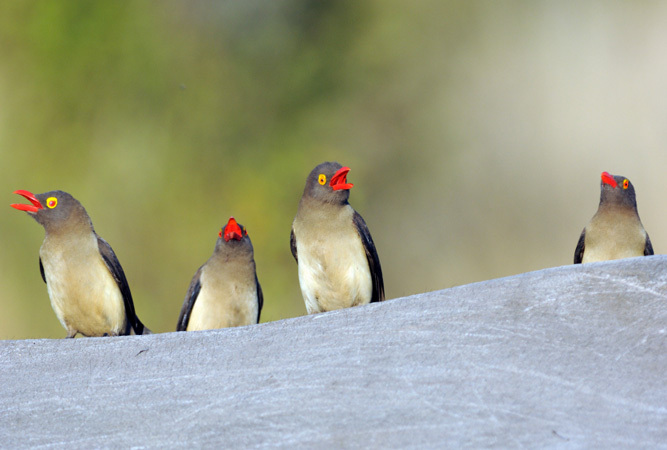 A set of experiments measured the Red-billed Oxpeckers’ response and preference to a choice of four species of ticks and two alternative food sources, namely blood and meat. The National Zoo’s Executive Director, Dr Clifford Nxomani says the first breeding of a Red-billed Oxpecker at the Mokopane Centre is a notable accomplishment for the National Zoo. “However, the real success story will come when the third generation of Red-billed Oxpeckers breed and their offspring can then be reintroduced into the wild. We are very proud of this accomplishment by our Research Department”. He further adds: “The techniques mastered by the National Zoo through the breeding of Red-billed Oxpeckers could be adapted in order to also successfully breed with Yellow-billed Oxpeckers in the future”. Oxpeckers breed as often as three times during the summer months and lay only one egg. Two or three helper birds assist with the nest building and feeding of the chick. The parent birds are responsible for the incubation of the chick. According to the EWT’s Arnaud le Roux, government departments are also seeking assistance in compiling an oxpecker policy for the protection of these birds as more people wish to establish these birds on their land, while public interest in oxpeckers and their role in the environment are growing. • Changes are afoot: The NZG is presently redeveloping several aspects of the visitor experience and will announce progress and new initiatives from time to time. Visitors to the property may notice enclosures under construction or redevelopment. • The 85-hectare Zoo in Pretoria houses 3117 specimens of 209 mammal species, 1358 specimens of 202 bird species, 3871 specimens of 190 fish species, 388 specimens of 4 invertebrate species, 309 specimens of 93 reptile species, and 44 specimens of 7 amphibian species. • More than 600 000 South Africans visit the NZG annually. • The NZG is ranked as one of the top 10 international zoological gardens. • The NZG celebrates its 110th birthday next year. is it possible to be a private breeder of oxpecker birds? Is it allowed? What type of registration do I need as a breeder and what are the specifications in cage size, feeding methods and location preferable. This project will be operated in Kwazulu-Natal from a private home near the coast. Street Address – Thabo Mbeke Drive, off R101. Tel: +27 (0) 15 491-4314. Please can you give us contact details of Mokopane breeding centre. We are interested in the capture and breeding of the oxpecker.We are cattle farmers in Swaziland.If there are any contacts closerto Swaziland,like Mpumalanga or Natal,please let us know. please can you put me in touch with the breeding centre in Mokopane.